Give the best Christmas gift of all with a spa gift basket. Using patio paint to paint your pot you can then put in all your bath goodies to complete the package. This is great for relaxation. Keep for yourself or give as a gift. Use sponge brush and Cloud White to paint rim and inside pot. Use sea sponge to pounce Hydrangea Blue on bottom section lightening pressure towards top. Use sea sponge and Blue Bahama to lightly blend into Hydrangea Blue section. Use sea sponge and Sweet Pea to blend into Blue Bahama section continuing up to rim. Use liner brush and Hydrangea Blue to paint lettering. 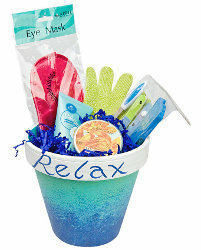 Fill gift pot with eye mask, bath mitt, bath salts, lotion, candle, or whatever favorite pampering products gift recipient will enjoy. Wrap pot in cellophane gift bag. Tie with ribbon.